Preheat oven per pizza directions. On prepared pizza dough, pour enchilada sauce and spread to within 1" of the edge. 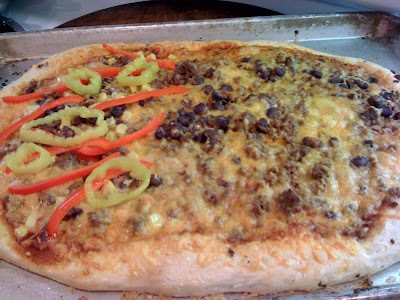 Top with ground beef, black beans, cheese, corn and bell pepper strips. Bake in oven as directed. Top with jalapeno or banana peppers. Since my hubby doesn't like corn or peppers, I only "dressed" half the pizza so he'd eat part of it. He doesn't like corn or peppers so I only put them on one side. Thinking back, it might have been tasty to add a little chopped cilantro too! Enjoy your Friday Night Pizza night with your family. Make your own pizza creation with your favorite toppings. Experiment and have fun! That sounds yummy! Our family eats tons of echiladas and tacos. Never thought of using the ingredients as pizza toppings! Yum, another great pizza variety to add to my "Try It" list. Chicken Enchilada and a pizza together. Umm... that sounds good. I've said it before and I'll say it again the older I get the more I like Mexican food!